With the NVIROMON-1S you get an environmental monitoring system that will assist with 24/7 monitoring of server rooms or remote sites, with particular reference to the data centre. This product is used to monitor and control the conditions inside a room, detecting whether it is too cold, too hot, too wet or if there are any unwanted gases or a fire. It detects when there is a power outage, regardless of the reason. It also allows you to have complete control on who enters the room, when they can enter and for what reason. There is an option of a full security alarm system that can even capture images of people entering. You will be able to see and hear if anything is out of the ordinary; but best of all, it will alert you via sms if you are not close by. It can monitor and control any room, for example a server room or a medicine room in a pharmacy; in fact, any room that houses sensitive equipment. You will have hands-on information on the conditions of the room, 24 hours a day, 7 days a week! The system can be set up according to your needs, depending on what is important for you to monitor and control. Many server rooms have more than one air conditioner, blowing away at a constant rate to keep the room cool enough that the servers will not overheat and bomb out, or to prevent other sensitive equipment from being damaged. At the same time, unfortunately, it sends the electricity bill sky high. Therefore Netshield developed the Naccumon, a standalone unit that on its own can regulate a pre-set temperature, automatically switching between 2 single phase air conditioners. When a temperature sensor senses that the room is warming up for reasons such as doors being left open, it will ensure that both air conditioners are running until the preferred temperature is reached again and then only switch to one to keep the temperature constant. This can result into up to a 50% saving on electricity used by the air conditioners and also prolong the life of these single phase units’ next service cycle. The Naccumon is not only a device to regulate air conditioners and temperature but it also provides Type III surge protection for these units and is able to inform you of temperature condition changes in the room and the condition of the physical units via sms or email. 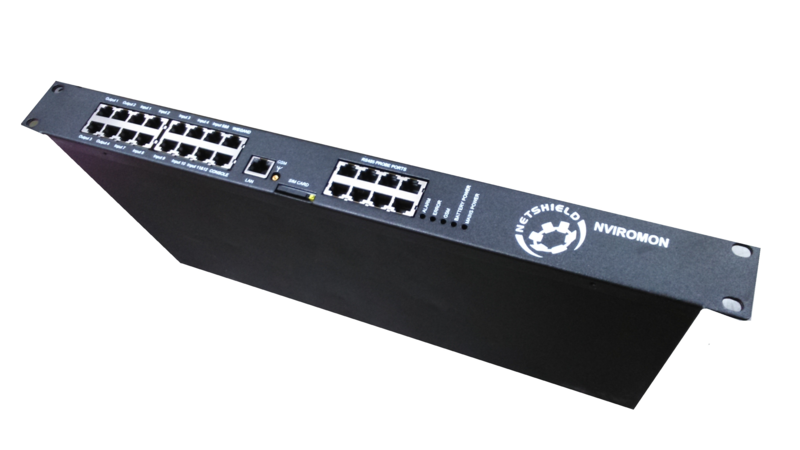 The Netshield Monitor One SNMP software can manage a client’s entire network. It enables the manager to have a bird’s eye view of all the data rooms in the network, irrespective of which province or country they are located in. It can monitor unlimited devices such as UPS’s, printers and servers. It keeps a log that is time and date stamped on network events which enables the manager to pull up important statistics as and when they please. It can manage 3rd party SNMP Enabled devices if an MIB file can be obtained for the device. It can also manage devices with an IP address, by sending out a ping to the device. MONONExx Software notifies through e-mails or SMS messages. An additional modem with a SIM card is required to do the latter. It has a once off purchase price only, with no licensing fees afterwards. It is available for 8, 50, 200 or unlimited number of devices. It can be used by itself or in conjunction with the NVIROMON-1U/S. A demo version is available from the Netshield Website that will enable the potential user to try it out. It can then be activated permanently when purchased. Have you ever been in situations where you wondered if you remembered to switch on the house alarm, or switch off the lights, or the geyser, or locked the door? Perhaps you are going to arrive home later than you planned and you wished there was somebody at home to just switch on the lights, or you are running late and somebody is waiting in front of your gate that needs to enter ….! Or in the reverse, wouldn’t you want to be informed through SMS when somebody enters through your gate, or cut your electric fence or is busy with cable theft? All this and much more can be done by the Netshield Nviromon-Lite. Purchasing it will enable you to do all this by just sending/receiving an SMS or leaving a missed call from your cell phone. The applications for the Nviromon-Lite are endless. It is a tool that enables one to remotely control and monitor applications and devices. It will inform, monitor and activate on command depending on the need. It is not distance dependant and therefore can also be used for remote sites, 2nd properties, offices etc. To warn you through SMS and/or siren when there is fire, smoke, intruders etc. The unit has 6 inputs, where different sensors can be connected as needed. It has 5 outputs which enables the user to customise according to individual needs. In addition to the Nviromon-Lite, a SIM card must be purchased from any cell phone provider in order to be able to send or receive an SMS. There is also an additional Remote Control available for fast activation within a range of a 100m when it is not always practical to use a telephone. The NVIROMON-LITE is easily configured using NVIROMON-LITE software on a windows computer. This allows the user to create his own setup for his own application. No programming skills are required. A simple and user-friendly interface allows powerful configurations.